One of the things that I love about working at CollegeMobile is all of the people who I get to meet and work with. Across the board our clients are all amazing and we have strong and unique relationships with each of them. Over the course of working here I began to realize an interesting fact about our company that didn’t seem so obvious to me at the start: at CollegeMobile we develop customized native mobile applications, this was of course obvious to me. This means our product is not a “boxed” product and one size definitely does not fit all. We listen to what our customer’s business problems and needs are and develop the mobile software to solve that exact problem or meet that exact need. Being a customized mobile app shop means that we get to work on some really cool projects. The thing that I started to realize though after working with each client is that not only do we customize the software for the client but we also customize our interactions and process for each unique person and organization we deal with. This dawned on me when I met Chris Kendall from The Raw Advantage. Chris is a raw foodie and promotes the lifestyle around North American. Chris has a huge appreciation for fresh fruit and veggies and also greatly appreciates nature. Instead of meeting him in a board room or a restaurant we thought we would switch it up. We grabbed a picnic blanket and sat down by the river in our bare feet and fleshed out all of the details of what Chris wanted in his app. This kind of client-experience customization is what we are proud of at CollegeMobile. Chris was completely in his element and our brainstorming was comfortable and relaxed and produced the best results for his end product! 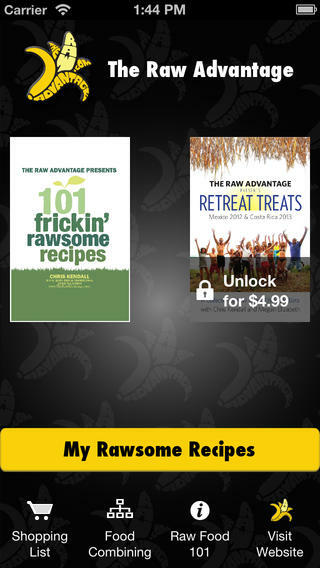 Check out The Raw Advantage Raw Recipe app today and make something delicious! Until next time, as Chris would say, “Peace, love and seasonal fruit”. If you have an idea that you would like us to customize for you, contact us toll-free at 1-800-298-7081 ext 720 or email us at contact@collegemobile.com.